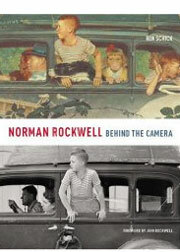 Norman Rockwell: Behind the Camera is the first book to explore the meticulously composed and richly detailed photographs that Norman Rockwell used to create his famous artworks. Working alongside skilled photographers, Rockwell acted as director, carefully orchestrating models, selecting props, and choosing locations for the photographs–works of art in their own right–that served as the basis of his iconic images. Readers will be surprised to find that many of his most memorable characters-the girl at the mirror, the young couple on prom night, the family on vacation-were friends and neighbors who served as his amateur models. In this groundbreaking book, author and historian Ron Schick delves into the archive of nearly 20,000 photographs housed at the Norman Rockwell Museum. Featuring reproductions of Rockwell’s black-and-white photographs and related full-color artworks, along with an incisive narrative and quotes from Rockwell models and family members, this book will intrigue anyone interested in photography, art, and Americana.